Thank you for your interest in working at Sheri Griffith Expeditions . We are very proud of the quality of services we provide and our commitment to excellence. SGE has been in business since 1971, offering outstanding river journeys to people from all over the world. We provide an atmosphere where people feel safe, comfortable and are able to relax and enjoy their adventure. Many of our guests have been coming back year after year due to the wonderful experience they have had on the river with us. It is important to note that the position you are applying for includes many facets. Customer service is the most obvious and very important; however your duties will also include: safety procedures, rigging and de-rigging, maneuvering boats in flat water and whitewater, loading and unloading equipment, cleaning and repairing boats and equipment, completing paperwork, conforming to all government agency regulations, following company policies, risk management and providing first aid, cooking and related food services, recycling, managing garbage and trash, river rescue, entertaining guests, interpretation of the geology, history, flora and fauna, teaching our low impact camping and use of the outdoors philosophy, working outdoors in various weather conditions and supporting the entire Sheri Griffith Expeditions organization. SGRE requires all guides be at least l8 years old and have a minimum of Wilderness First Responder (WFR) and CPR certification (or equivalent). Guides must have a professional attitude and be willing to learn and accept new ideas. Initiative is highly valued. Guides must work long hours during rush periods and not be subject to burnout and moodiness. They must work well under pressure and be team players. Click here for a full job description and click here to download a copy of our Guide Application. SGRE is looking for quality professional drivers with Commercial Drivers License. Hours will vary week to week depending on the number of trips. 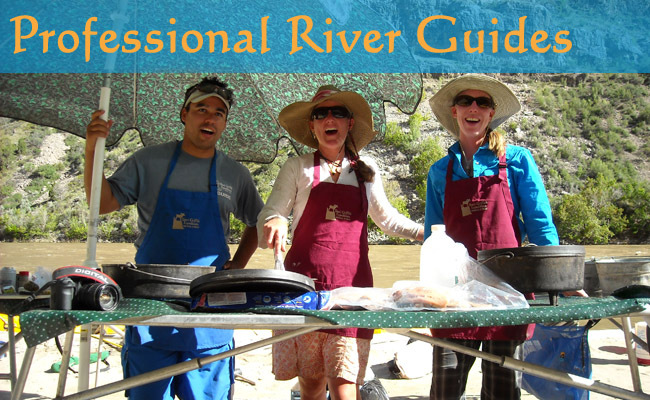 The job includes shuttling guests, gear and staff to and from different locations for the river trips. Drivers are expected to help load and unload boats and gear. They are responsible for safety of the rig, trailers and on the road. Must have a professional attitude and be willing to learn and accept new ideas. Click here for the Driver Application. Sheri Griffith River Expeditions is an authorized concessionaire in Canyonlands National Park and Dinosaur National Monument. We are an equal opportunity employer.